Anybody who says they don’t like baked beans is either a liar or some paleo buzzkill you don’t want at your cookout. For the rest of us, there’s this awesome suite of recipes that makes for a perfect meal, from apps to dessert. Pairing (and incorporating) baked beans with perfectly complementary flavors, they’ll make you the hero of your block party. First up, a serving of wings both sweet and tangy with crispy broiled skin. You can write the rest of the description yourself, our fingertips are too sticky to touch a keyboard now. 1. In a blender combine garlic, ginger, sugar, lime juice, 3 tablespoons fish sauce, and sriracha as desired, and blend until smooth. 2. On low speed, slowly stream in oil and process until completely emulsified. 3. Place chicken wings in an extra-large zip-top bag and pour marinade over. 4. Seal tightly and massage wings to ensure that they are completely coated. 5. Marinate in the refrigerator at least 30 minutes and up to overnight. 7. Divide marinated wings between two foil-lined half sheet trays and roast, rotating trays halfway through, until golden brown and fully cooked, about 45 minutes. 8. When cool enough to handle, transfer to a large bowl and set aside. 9. In a medium saucepan set over medium heat, combine brown sugar, butter, and olive oil. 10. Cook, whisking occasionally, until butter is melted and brown sugar is dissolved. 11. Add remaining fish sauce and sriracha, as desired, and whisk until sauce is thoroughly combined. 12. Bring to a boil and reduce slightly, about 5 minutes. 13. Pour sauce over wings and toss until completely coated. 14. Return wings to sheet trays and, using a blowtorch, caramelize wings (this can also be done under a broiler). 15. Transfer to a serving platter, garnish with scallions, and serve with cucumber spears. Slow-roasting is how cheap and tough cuts claim their throne. To feed a large group the best meal they’ve ever had, you’re going to want to put the time in on this pork shoulder. They’ll all tell you it was worth it. 2. Meanwhile, puree baked beans and maple syrup in a blender or food processor. Transfer 1 cup to a medium bowl and reserve the rest for later. 3. Whisk chicken stock into the 1 cup baked bean sauce and set aside. 4. Heat vegetable oil in a large dutch oven over medium-high heat. 5. Season pork shoulder generously all over with salt and pepper. 6. When oil is shimmering, sear, skin side down, until golden brown, about 5 minutes. Flip, and repeat on opposite side. 7. Add chicken stock mixture to pot. Bring to a simmer, then cover and transfer to oven. 8. Braise, basting every hour or so, until meat is falling off the bone and juices are thick and syrupy, for 5-6 hours. 9. While pork is braising, in a large bowl whisk together vinegar, sugar, and mustard. 10. Slowly drizzle in olive oil, whisking constantly, until dressing is emulsified. 11. Season to taste with salt and pepper. 12. Add cabbage, carrot, and parsley leaves to bowl and toss to coat. 13. Set slaw aside, covered, to allow flavors to develop, at least one hour. 14. Remove pork shoulder from oven and transfer to a grooved cutting board, leaving remaining juices in dutch oven. 15. Whisk in 1 cup reserved baked bean sauce. 16. Using two forks, shred pork into big chunks, discarding bones and any excess fat, and return to pot. 17. Toss thoroughly to coat with sauce, then build sandwiches. 18. Drizzle with remaining baked bean sauce, top with cabbage slaw, and serve. Everything’s better with bacon. But have you ever considered that bacon is better with beans? Beans are bacon’s bacon. Better combine the two into one recipe, just to be safe. 2. Arrange sliced bacon on a half sheet tray and bake until fat has rendered and bacon is crispy, about 25 minutes. Reserve bacon drippings and set cooked bacon aside. 3. When bacon is cool enough to handle, coarsely chop and set aside. 4. Meanwhile, transfer 2 tablespoons of bacon drippings to a large skillet set over medium heat. 5. Add diced slab bacon to pan and fry lardons until well browned and crispy, about 10 minutes. Remove lardons from the skillet with a slotted spoon and transfer to a paper towel-lined plate to drain. 6. Reduce heat to low and add onion to pan. Cook, stirring occasionally, until well browned, 20-25 minutes. 7. Remove onions from pan with a slotted spoon and transfer to a large bowl and set aside. 8. If necessary, remove all but 2 tablespoons bacon drippings from pan. Return heat to medium and add garlic, star anise, and bay leaves to pan. Saute until fragrant, about 1 minute. 9. Add dijon mustard, malt vinegar, and black pepper to pan and cook, stirring constantly, about 30 seconds longer. 10. Remove from heat and transfer to large bowl with cooked onions. 11. 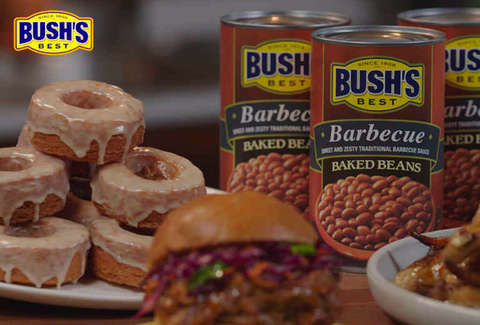 Add lardons and BUSH’S® Barbecue Baked Beans to bowl and stir to thoroughly combine. 12. Transfer bean mixture to a 8-inch x 8-inch casserole dish and bake until hot and bubbly, about 20 minutes. Top with chopped bacon and serve. You’ve partied hard, and helped others to eat well. Time for your reward: a gooey, sweet, fresh and fluffy maple doughnut. Nobody’s saying you HAVE to dip it in the leftover pureed beans, but -- *gasp* -- what if you did? Like gummy candy and popcorn, or pretzel sticks and chocolate, you have have just invented the new great salty/sweet combo. 1. Heat 1” oil in a large, heavy-bottomed pot to 350 degrees. 2. Meanwhile, in a large bowl, whisk together flour and brown sugar. 3. Grate butter into mixture and stir until butter is coated and evenly dispersed throughout the flour mixture. 4. Pour in buttermilk and stir until dough is just combined. 5. Turn dough out onto a lightly floured work surface and shape into a rough rectangle. 6. Roll out to 1⁄2-inch thickness, dusting with additional flour as necessary. Fold the dough in half and roll back to 1⁄2-inch thickness; repeat folding and rolling process five more times. 7. Using round cutters, cut out doughnuts, rerolling scraps if necessary to make a dozen, and set aside. 8. When oil is hot, fry doughnuts in batches, about 2 minutes per side, until golden brown. Allow to cool on a wire rack set over a half sheet tray. 9. Carefully dip the top half of each doughnut into the glaze (recipe below) and return to wire rack. 10. Allow glaze to set, about 5 minutes, before serving. In a medium bowl, whisk together confectioners sugar, milk, maple syrup, and maple extract, if using, until completely smooth (glaze should be roughly the consistency of glue; adjust as necessary with more confectioners sugar if glaze is too thin, or more milk if too thick).